Craft breweries — the American version of a neighborhood pub — are as hot as coffee shops, and I’m thrilled to have a new one at Lake Anne Plaza in Reston. The LAKE ANNE BREW HOUSE embodies everything that is romantic and wonderful about a small business. It has a product the community has been craving; it has committed owners who want to create the best brew house possible while fostering community; it is sited in a place that needs more of both of those things. What they do: LAKE ANNE BREW HOUSE sells its small-batch, hand-crafted beers directly to loyal customers from our nano-brewery taproom. You won’t find this (delicious) beer anywhere else… unless you take a growler home with you. Since the day the LAKE ANNE BREW HOUSE opened in May, Restonians have made sure they have a difficult time keeping the brews in stock. The owners are a husband and wife team — Jason and Melissa Romano. Jason is no newcomer to this craft — in fact, he has received accolades for many of his signature recipes. The BREW HOUSE is a way to scale production to meet the demands of a growing craft beer drinking market. Melissa is an Architect and designer, and that is obvious the minute you walk through the front doors. The space is beautiful. Jason and Melissa have a shared goal: to provide an inviting location for the community to gather and appreciate a hand-crafted selection of exceptional beers. And what, exactly, are those beers? Their flagship brews are Live-Work-Play IPA, Reston Red, Brown’s Chapel Brown Ale, Lake Anne Skinny Dip Kolsch, and Simon’s Stout. Due to their small capacity, they may run out of a listed beer before they have a chance to update their website or Facebook page. So, really, you just need to be there when they open on Thursdays to make sure you can get what you want. Did I mention the patio? Yes, they have a great one right on the lake. There are few nicer ways to spend a gorgeous summer evening that with friends supporting a local, small business. Their hours of operation are Thursdays 4pm – 10pm, Fridays 4pm – 11pm, Saturdays 10am – 11pm and Sundays 12pm – 5pm. To find it, use your GPS to 11401 North Shore Dr., Reston, VA 20190. Then just walk to the plaza and head toward the sound of laughter. Have you ever parked on Moorings Drive on your way to the Reston Farmer’s Market and wondered what kind of houses the street leads to? Let me tell you — it’s a wonderful mix of the different styles of Reston town homes. This neighbor is not only charming, it’s quiet and close to everything. The first cluster on your left is Brookshire, one of the first clusters built in Reston in 1964 and 65. It’s one of Reston’s smallest clusters and has an impressive ratio of green space to homes — 5 acres to 26 homes. Lush green foliage, magnificent old oak trees, interconnecting paths and recreational areas surround the cluster. These two and three bedroom townhomes feature an average of 1,500 square feet of living space. Then comes Chatham Colony Cluster. This is also a small cluster, with about 45 homes that each has a wooded backyard. These colonial style townhomes have brick exteriors, shuttered windows, and two designated parking spaces. With three bedrooms and full basements, each home offers plenty of space for growing families and empty nesters alike. And like most Reston homes built in the 1970’s, each has beautiful hardwood floors and large windows. Next on the tour is Wyndmere Cluster, the newest addition to this area. Like all of the townhome clusters off moorings, residents have access to Lake Anne. Finally, there is Moorings Cluster, built between 1971 and 1972. 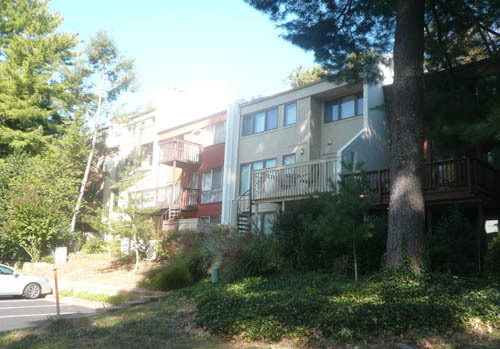 These spacious three- to five-bedroom townhomes have fantastic views of Lake Anne (70% are direct lakefront properties). Unlike many lakeside townhouse communities, each of the 50 homes in this neighborhood has a garage. All of these clusters off Moorings Drive have easy access to main roads and public transportation. This is the kind of neighborhood where you can take full advantage of everything Reston has to offer — you can walk to Lake Anne, jog on the nearby Reston Association paths, or be at Reston Town Center in a matter of minutes. It’s also close to ballparks, pools, tennis courts, the sprinkler park (off North Shore Drive) and more. Many residents have small boats and canoes that they take out on Lake Anne, enjoying a leisurely paddle to the plaza for concerts, festivals and dining. In the summer, residents can walk to the popular Farmer’s Market and Reston Market. Neighborhood residents attend Reston’s Lake Anne Elementary, Langston Hughes Middle and South Lakes High School. One of the things I always talk about is how much Reston has to offer everyone — adults and children alike. I was thinking about this as I chatted with my friend Susan who grew up here in the 1970s and lives here today. She said many of her favorite childhood activities are still things she loves to do — walking down to Lake Anne, swimming in the pools and boating on the lakes. Susan offered to talk to some of her friends who grew up here to share their favorite activities. I hope this list inspires you to get out and enjoy all that Reston has to offer. Susan has wonderful summer memories of walking down to the Lake Anne Pharmacy, splashing in the fountain, and dangling her feet off the pier. If she wasn’t doing that, she was exploring the Reston Association paths or lounging at one of the swimming pools. It seemed like summer in Reston lasted forever. Rick Morgan remembers summer days fishing off the pier at Lake Anne, eating peanut butter sandwiches and buying Coke from Larry at the pharmacy. These days, Morgan still enjoys Lake Anne. While he no longer spends the whole day fishing off the pier, he loves paddling his hand-made canoe across the lake on his way to the Reston Farmer’s market on Saturday mornings. Canoeing isn’t the only way to enjoy Reston’s lakes — paddle boarding is quickly becoming a favorite summer activity. Of course, if you don’t have a canoe, barge, or paddle board to explore the lakes, you can rent a paddle boat or kayak at Lake Anne. Lake Anne and Lake Thoreau offer the opportunity to tie up and enjoy lunch or dinner at an outdoor patio. But if bird watching is what you want, Lake Audubon is the spot. During a leisurely paddle, you’re likely to see heron, loons, cormorants and more. Lynn Kessler says the walking trails around the Nature Center are one her family’s favorite nature activities. Summer concerts at Reston Town Center and Lake Anne are fun ways to spend an evening with friends and family. The entertainment style varies, but it’s always free and always a great way to get out and enjoy a beautiful summer evening. Kessler says her children love the water spouts at the west side of Reston town Center. This summer, hanging out at Red’s Table at South Lakes Village Center and Lake Anne Brew House at Lake Anne joined the list for several people. And even though it hasn’t opened yet, people are anticipating the arrival of the Lake Anne Coffee house. Yes, Reston is a wonderful place to have a grown up, and a wonderful place to see children (of all ages) enjoying the activities we all loved when we were young. Popcorn, Movies, Pools - A Perfect Summer Combination! The more things change, the more they stay the same. In fact, the summer fun that makes Reston a great place to grow up hasn’t changed much over the last 40 years, according to people who grew up in Reston… and decided to stay. For example, Restonian Lisa Kelly’s absolute favorite activity as a child was movie night at the RA pools. Now her children share the same love of that weekly summer ritual. “We love it because it is a family friendly event that is free and fun! It’s a unique way to watch a movie outside, and we look forward to it each year,” said Kelly. 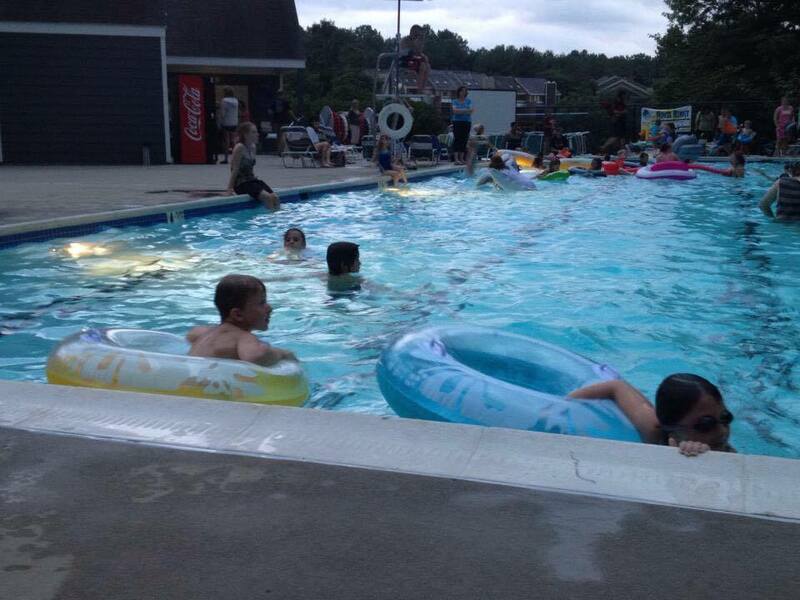 Reston Association hosts the Family Dive In movies. Always free, always fun. RA provides the popcorn and drinks, but you need to bring your favorite float. Movie titles are advertised at the event location, but does it really matter what the movie is? There is free popcorn! Movie nights will be canceled in the event of rain, so let’s hope for a dry summer. Contact Ashleigh@reston.org or call 703-435-6577 for more information or weather related cancellations.